Bathroom Aids,Bathroom Toilet Aids, Bathroom Cleaning Aids and Bathroom Accessory Aids. Scroll down to see our selection of Bathroom Aids for sale. 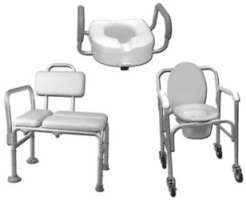 Bathroom Aids are products that give elderly or disable patients the ability to do everyday tasks. Our various bathroom aids include self-wipe bathroom toilet aids, shower massagers, fog-less mirrors, specialty toilet seats, a wide variety of bathroom cleaning aids, and weight scales. Bathroom aids assist caregivers and other healthcare professionals whilst caring for others and can perhaps, allow someone who currently needs help, to help themselves. Bathroom aids give the user a sense of independence. For many the simple task of bathing, brushing your teeth, and using the commode can be made easier by using bathroom aids. Accidents happen often and bathroom aids help to prevent these from occurring and can improve your daily living..